parties at our house. We call the get-togethers Beer Snobs Unite! The idea is not to get together and bash the macrobreweries or those who are not as enlightened as us (as the name might suggest), but to get together and celebrate the wide range of tastes and styles of beer…and of course to drink it. The premise is that each month there is a theme (previous themes have been, Seasonals, Most Offensive/Humorous Name, Beers of Missouri, etc.) and each person brings a snack and a six pack (or equivalent thereof) and we taste each beer in turn. 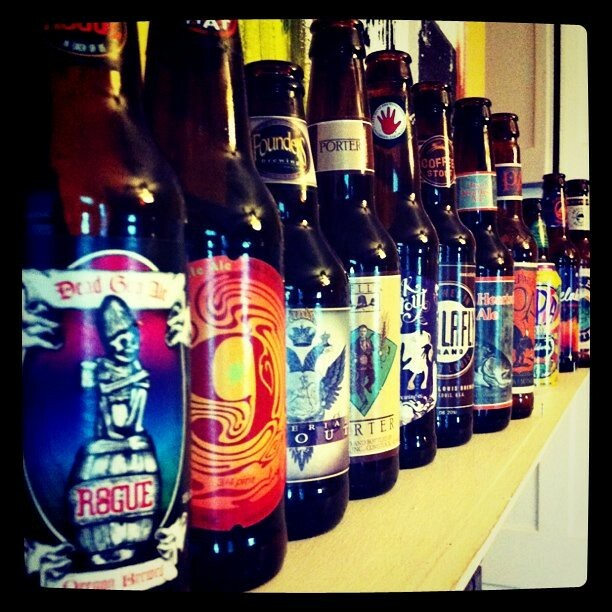 The members are responsible for introducing their beer to the group (such introductions have ranged from summaries of wikipedia entries, reading directly from the six pack carrier, rate beer reviews… even food pairings), then we taste, comment (most of the time briefly) and move on to the next one. timing was wrong for me to get some Hopslam, so I chose the next best thing (from Bell’s that is): Two Hearted Ale. I actually didn’t particularly like this beer the first time I had it (way back when the only IPA I had ever had was O’Dell IPA). Now I consider it my “go to beer” in most situations. 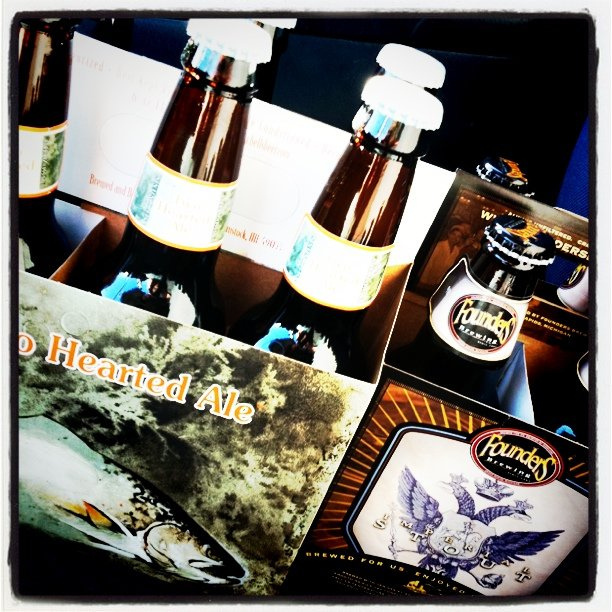 If there isn’t anything new to get or I just want a solid great tasting beer, I reach for the Two Hearted. My wife, couldn’t be more opposite on the taste spectrum than me, but much like Communism and Fascism, more unites us than divides us. She chose the newly released seasonal, Founder’s Imperial Stout. We both first had this beer about a year ago and we fell in love with it (she more than me, admittedly, though I have stated before in this blog that I love Founder’s Imperial Stout). She calls it “liquid motor oil goodness…” and you can’t buy a better endorsement than that. I want to give a couple brief tasting notes on each of the beers that we had for the tasting…no full review because in most cases I only had a taster’s worth. Rogue Dead Guy Ale: Always a solid beer. No frills, just great taste. It was a great way to start the night. Read more of my thoughts here. Magic Hat No. 9: I’m not the biggest fan of No. 9, but there’s nothing wrong with it. It has a distinct apricot taste that I think you either like or dislike. That said, it was a pretty decent follow-up to Dead Guy. Founder’s Imperial Stout: Amy was anxious to taste hers since it had been almost a year since we had it, so we tasted this one earlier than I had planned. 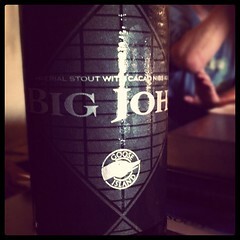 The consensus of pretty much everyone present was that this was an awesome beer. 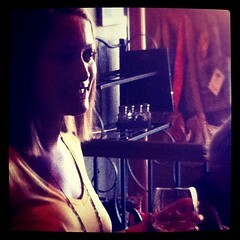 There was an audible, collective gasp as she poured the first motor oil taster. Bell’s Porter: This was my first time tasting this beer and I have to say it was a very solid Porter. Nice color and a good mouthfeel. I could definitely see myself getting one of these again. Left Hand Milk Stout: I love this beer and I always forget that I do. It has such a pleasantly thick mouthfeel and caramel roastiness. 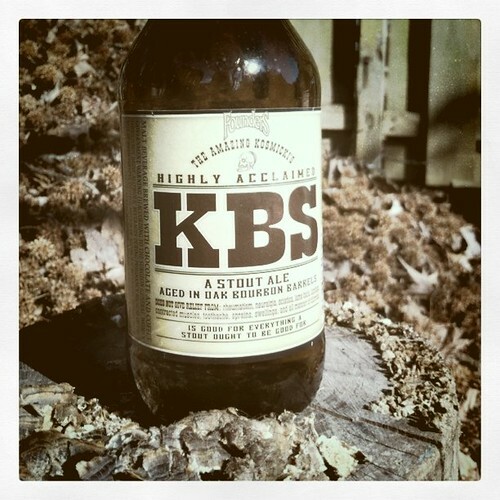 Its low ABV and very smooth taste make this a very “sessionable” beer even if you couldn’t define it as such. Schlafly Coffee Stout: I’ve talked about my love for Schlafly’s Coffee Stout before. This night was no different. A nice pleasant balanced coffee stout. 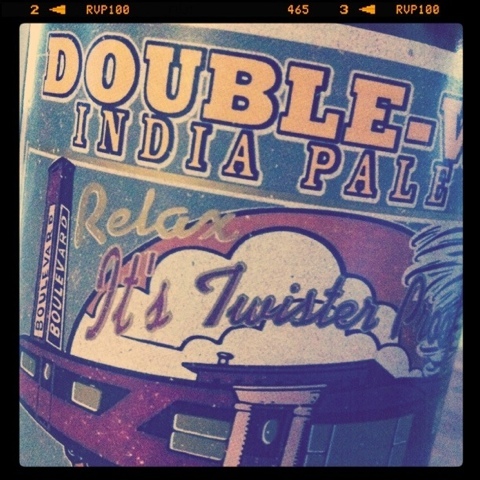 This is one of Schlafly’s best beers. doesn’t), this was the first true craft beer I had ever had in my life. I had tasted Blue Moon, Tsingtao and other so-called macro-crafts before, but nothing like this beer. This will forever be the beer that changed it all for me. Milwaukee’s Best Light (yes…The Beast): This was pretty predictably and universally panned by everyone present. The claim to fame was that 2 Tallboys of Beast light and a pack of smokes costs less than most of the beers that everyone else bought. The taste was exactly as I had left it in college: thin, watery, and an overwhelming (to me at least) taste of pear. Caldera IPA: This one was a new one for me. Very fresh and crisp. A lot of grapefruit in the nose and taste. I will be looking for this one again. Sierra Nevada Torpedo Extra IPA: I think this is a great beer, but I didn’t get a lot of the “extra” part of the Extra IPA, just a nice malty and decently bitter beer. 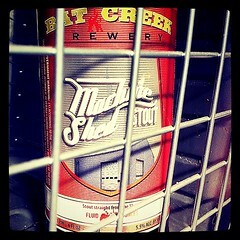 Deschutes Black Butte Porter: There was only one bottle of this one available, so I didn’t get much. It was also get later and then night and my memory gets a little fuzzy 🙂 The only thing I remember is that I didn’t like it as much as Bell’s. And a Schlafly mix-a-six which incuded Kolsch, Oatmeal Stout, Pale Ale, and Scotch Ale: I got even less of each of these beers than I did of the Deschutes Black Porter. Luckily I have had all of these beers before. All of them are solid selections from Schlafly. These parties have been instrumental in my quest for deeper understanding of beer and since I have now figured out how to wrap my head around the concept of pacing when you are drinking 14-18 types of beers from 4 oz. taster glasses :), are a fun diversion from the workaday world. Thanks to all the fellow Beer Snobs who have helped make it possible! 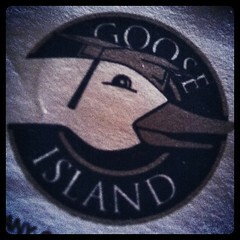 I am in love with a logo! 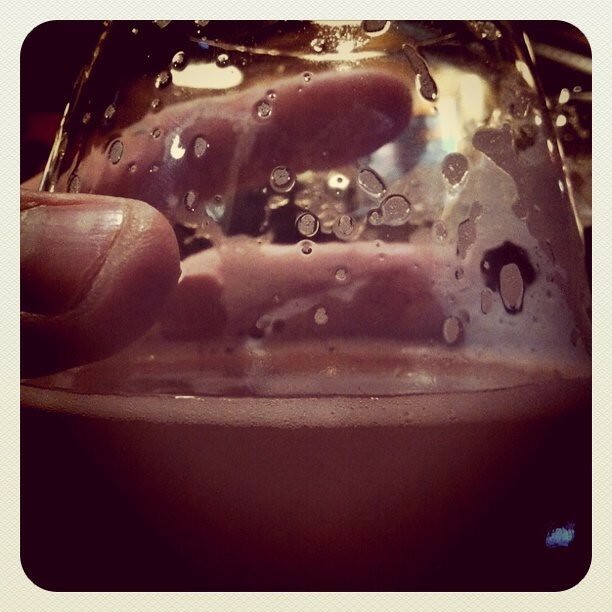 or…Urban Chestnut: Hop or Chestnut? 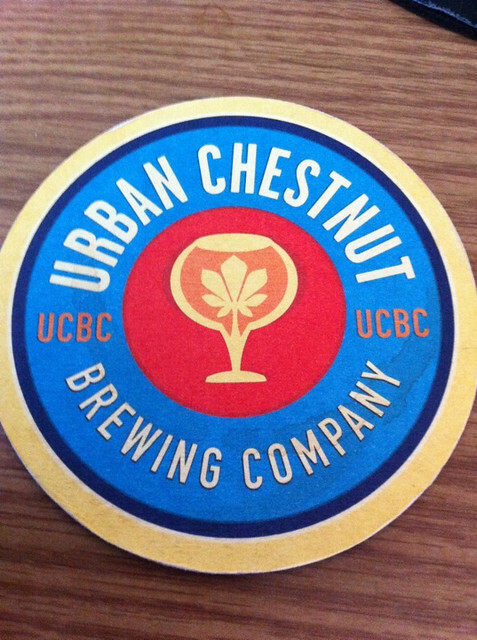 So….I wrote the post about Urban Chestnut Brewing Company and I left out the fact that I swiped a coaster. I know….capital offense (at least I left the glassware). And I have been looking at that coaster for the past three days and simply admiring it. I love the Urban Chestnut logo. The colors are awesome (yellow, red and blue don’t come to my mind when I think of a good color scheme, but they definitely work). 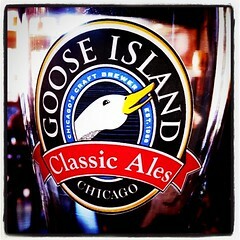 The text is readable And…I love the icon of the glass with the “foliage” in it, but I have one question. In the glass, what kind of leaf is that? I showed the logo to a friend of mine at The Logo-Mat (http://thelogo-mat.blogspot.com/) who specializes in these things and he thought it looked like a hop leaf. I, of course, thought (after doing an image search) it looked like a Chestnut leaf (which made the most sense to me). Either way, I think it’s an outstanding example of this new STL brewery’s commitment to quality and craftsmanship. 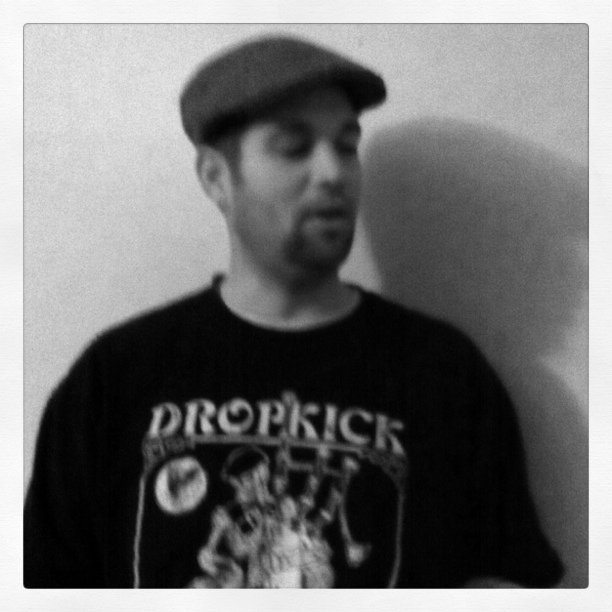 For a more concise and informed opinion of the logo, check out Matt’s full review here. I totally agree with him when he says “I’d wear a t-shirt adorned with this logo.” I should have bought one while I was there. Hop Leaf on the Right...Chestnut on the left. Or was that the other way around? What do you think? Hop Leaf or Chestnut leaf? Does it even matter? Do I get free beer if I win? How about a free shirt? Is there anyone at Urban Chestnut who could field this question? brewing equipment from the street. The main part of the building has become the warmly lit and very inviting tasting room and was, last night at least, pretty packed. The crowd seemed to run the gamut from beardy beer geeks to older couples out for the night and, for the most part, everyone seemed to be digging the live music. The atmosphere was altogether warm and inviting (I kept looking around for Tiny Tim and a blazing hearth) and really seemed like a great place to go and hang out on a regular basis (wish I lived closer). Amy and I were able to try two beers (we were kind of pressed for time and the distance from home limited how much we could drink). Urban Chestnut has two “lines” of beers: Reverence (“Our celebration of beer’s heritage ~ brewing classically-crafted, timeless European beer styles”) and Revolution (“Our contribution to the renaissance of craft beer—brewing artisanal, modern American beers”). We decided to try one from each. Being the hop lover that I am, I went with the Hopfen (ABV- 6.2%, IBU’s- 55)–a “‘Bavarian IPA’…brewed and dry-hopped with a variety of Hallertau Hops”. I loved it immediately. Bold, hoppy, crisp and refreshing. I could have had 10 of them, judging by how easily the first one went down. I can tell that repeated visits to Urban Chestnut will be necessary to fully determine it’s place in the St. Louis beer scene, but the preliminary data is definitely positive. The atmosphere is like someone’s living room (assuming of course that someone has great taste and lots of beer) and the beer itself doesn’t seem like it should be from a brewery that is in its first few months of production. In fact, pretty much every aspect of the brewery–website, logo, marketing, tap handles, glassware–is extremely polished. I can’t wait to see where Urban Chestnut goes in the coming years. If they keep on their current track, the only place to go will be up. 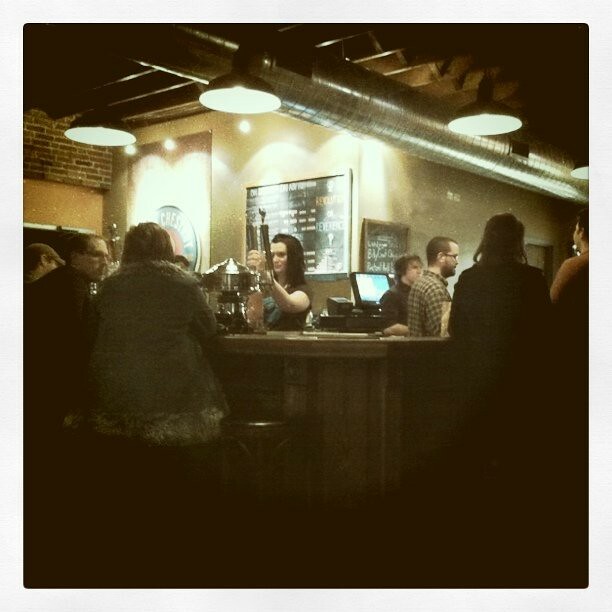 Have you been to Urban Chestnut? What did you think? Let me know in the comments. This stuff is great. I went to KS city in Nov and drank a gallon of this. Passed out in [my friend’s] hotel room in the bath tub with the water running and flooded the room. This stuff has a great memorable flavor. Scathing indictment? Or Five Star review? You decide….